• The impact of better education through higher graduation rates and the resulting improved lifetime earnings among youth who attend Clubs on a regular basis as opposed to others who do not benefit from such services within the same socio-economic population. • Lower teen pregnancy and motherhood rates, which create economic savings. • The impact of Clubs’ enrichment programs that enable youth to resolve conflicts and become more peaceful with their own peers and others in their communities. This is measured by considering reductions in youth crime rates and the savings that such reductions generate in the community. • Health education and its impact on reducing obesity and related diseases that leads to lower productivity and an increase in long-term chronic diseases. • Lowering the tendency for substance abuse and lowering of the costs associated with underage drinking, tobacco and drug abuse. • The ability of Club programs to help parents work or attend school in order to upgrade their skills. • Total employment and income impact of the Clubs through their annual expenditures, including both operational and capital budgets, as well as the donated labor of volunteers. To read or download the entire impact report, click here. 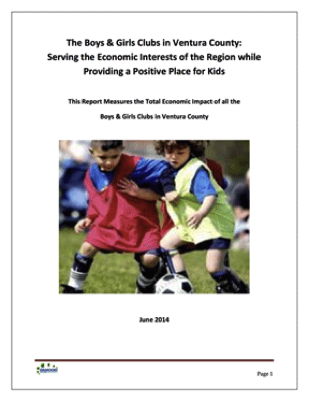 Every $1.00 invested in a Boys & Girls Club generates $15.45 of positive impact in the community.